Downtown Halifax’s Barrington Street is undergoing a shakeup with the loss of two mainstay specialty bookstores. For 36 years, United Bookstore has been a popular retailer of remaindered and used books. In an interview with Halifax weekly The Coast, store manager Dave McConnell says street construction and “the book industry’s woes” contributed to the impending closure, scheduled for later this month. 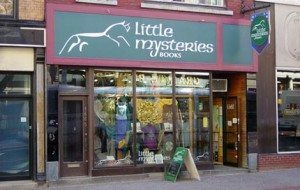 Just down the street, Little Mysteries Books has announced it will close at the end of August. Opened in 1990, the family-run boutique specializes in holistic health, occult, and spirituality products and books. According to a store newsletter, the family had hoped to find a buyer before September, when co-owner Sandra Smith retires and her daughter Vanessa heads to grad school in the U.K.